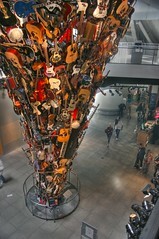 Located in the Music Museum of Seattle, Washington, this cone was built using numerous instruments (primarily guitars). Many of the guitars were hooked up to electronics and set on a timer to play music throughout the day. At the time, there was some sort of concert going on about 100 yards away so I was unable to hear tornado play its music.